If you have tile floors, then odds are you like when they are pristine and shiny. Unfortunately, regardless of the type of tile you have, keeping it clean can be a tedious process and requires constant maintenance. As such, assuming that you don’t have a ton of free time to dedicate to such things your floor will invariably collect dirt and grime, mostly around the grout in between the tiles. When that happens, everything starts to look unkempt and dingy, which can be a big downer. Thankfully, there is an easy way to spruce up your tile floors, and it won’t require anything expensive or complex. All you need is some warm water, baking soda, and some vinegar. A mop and a towel couldn’t hurt, too. Today we’ll go over the best way to clean your tile floors using materials that you probably already have sitting in your kitchen. Best of all, the results are amazing. For most households, this guide will be a breeze since you have everything you need already. In fact, that’s the whole point of this tutorial is to show you how to use items that are in your possession already to clean your floors. This means that you don’t have to go out and buy any fancy cleaners or equipment to get pristine results. That being said, though, even if you don’t have everything listed here it shouldn’t be hard to come by, and it should be cheaper than buying new cleansers or mops. If you want to make things easier for yourself, then you may want to pour the cleaning mixture into a clean spray bottle so that you aren’t wasting it when spreading it across your floor. However, if that seems a bit too much for you, then you can spread it the old fashioned way or dip your brush into the mixture as you go. No matter what, you’re going to have to get on your hands and knees, so either way works well. After seeing how well this works, you may decide that you want to use the cleaning power of baking soda and vinegar to clean other floors in your house as well. However, these steps are for grout lines only, meaning that it will only work well on tile flooring. If you want to clean hardwoods or other laminates then you’ll have to use a slightly different mixture of the materials, so don’t think that this is a be-all-end-all solution to your floors. Also, you shouldn’t have to do this too often (maybe a few times a year) so don’t think that you have to scrub your floor by hand all the time to maintain the results. Overall, this whole process is going to take time, so it’s best if you come at it with a plan. You most likely won’t be able to finish the whole thing in one sitting (unless it’s a small bathroom) so you should be strategic about where you clean so you can tackle the most important parts first and leave the rest for later. Nonetheless, it’s imperative that you get rid of any loose dirt and debris that is on your floor so that you don’t have to get any dirtier than necessary. This is a very simple step as all you have to do is put water into some baking soda until it forms a thick paste. If it’s too runny, add more soda, and vice versa if it seems too thick. It should stay on a toothbrush by itself. This is where your gloves and toothbrush will come into play, and it’s when you’ll be on your knees. To save yourself some pain later you might want to place some old clothes or rags underneath your kneecaps so that they don’t get too sore afterward. Brush a layer of paste onto the grout lines for as far as you can go. Don’t push yourself too hard, so feel free to do the floor in sections rather than trying to do as much as possible right away. All this will be is a mixture of equal parts vinegar and water. It’s best if you measure it out first so that you won’t have to keep adding a little bit of each to get the right consistency. This is what you would put into a spray bottle, or you can dump it on the floor as is. Just be prepared to spend more time mopping it up afterward if you do. You’ll notice that the soda and vinegar will react with each other and create a thick foam. Wait for it to subside so that it works deeply into the grout. If you wipe it off too soon, it won’t look as good. If you let the foam sit for long enough, then the dirt should come up quite easily. For best results, try to start in the area you sprayed first so that you are following the same path. Work out any problem areas with your brush and make sure that all dirt and grime is removed. 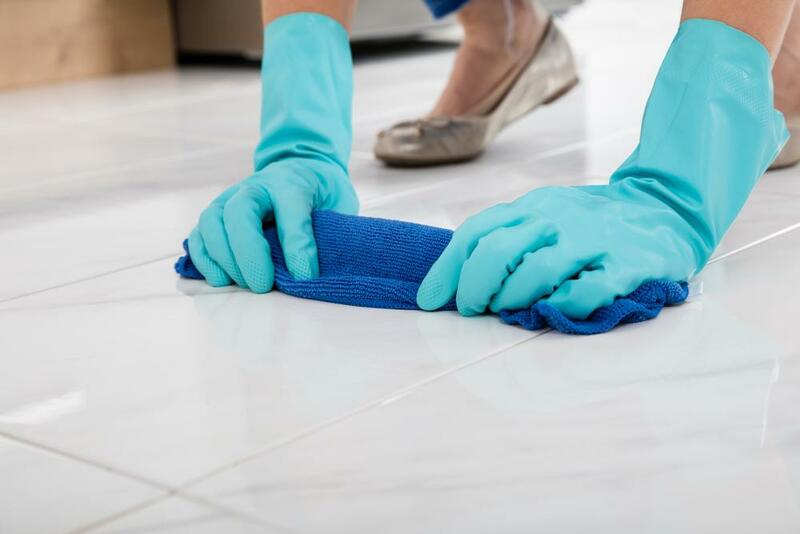 Once all the hard work is finished, then you can rinse the floor with warm water and soak it up with either a mop or a towel, depending on how much surface area you cleaned. As you dry it off, you should see a remarkable difference. Just be sure to wipe off all soda granules, so you don’t have a scratchy surface left. As we mentioned, don’t worry if it takes you a couple passes to get the whole floor cleaned. Scrubbing the tile with a toothbrush is not a lot of fun, so don’t overwork yourself. If you want to take a few days to finish no one will judge you (certainly not us!). Thanks for tuning in and we hope that you are amazed by the results.